Aesthetix Atlas review | What Hi-Fi? 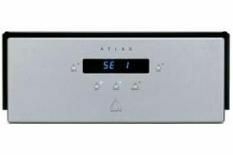 It might seem odd to describe a circa 10-grand Calypso preamp paired with the Atlas stereo power amplifier as something of a bargain, but that's exactly what this Aesthetix pairing is. It's not luxurious build or finish that marks these out; you'll have to look to the engineering for clues to this duo's greatness. Take a look inside these units and you'll find neat, carefully laid-out circuit boards with a great deal of attention paid to power supplies and magnetic shielding.The Atlas power amplifier also has a high-pass filter so that integration of a subwoofer is easier, if that's your thing. It's in the listening where these amps shine, though. When it comes to transparency and insight, this Aesthetix pairing has more in common with the likes of Audio Research's Reference 3 and Ref 210 pre/power combination than it does with the vast majority of 10-grand rivals. Remember that the mighty and mightily impressive Audio Research pairing comes in at almost three times the Aesthetix's money, and you realise just how good a sound we're talking about. As you'd expect, all the basics are spot-on. Tonally, the Calypso/Atlas combo is essentially neutral, with no undue emphasis on any specific part of the frequency range. More importantly, this amplifier is cohesive, with the bass, midrange and treble dovetailing brilliantly to make a seamless whole. This pairing is one of the most natural-sounding amplifiers money can buy. It delivers Jill Scott's vocals with a full dose of passion and soul intact: there's agility, an astonishing amount of detail and just the right amount of solidity. When it comes to rendering voices or acoustic instruments, this two-boxer even makes our reference Bryston pairing sound mechanical. You can add surefooted timing and strong dynamics to the list of plus points, too. This pre/power is great at conveying the ebb and flow of a large-scale symphony such as Mahler's 10th, and is similarly skilled at delivering Van Morrison's Moondance with all the jauntiness it deserves. Sonic perfection? Well, the Aesthetix is closer than most, but still open to criticism in some areas. For all its clarity and faithfulness, the duo doesn't quite deliver the full amount of punch in the midrange and treble. It needs just a little more bite at those frequencies to convey the full amount of aggression that the likes of Eminem or even Stravinsky's The Rite of Spring deserves. Also, the power amplifier doesn't sound comfortable when pushed very hard; the Atlas will go loud enough for most people, but just not to party levels. Even taking these shortcomings into account, this Aesthetix pairing is an astonishingly capable pairing. In overall terms, it remains the best we've heard at this price level or anywhere near it.